It’s awesome! Easy setup and 3 bars of WiFi everywhere, even in huge houses. 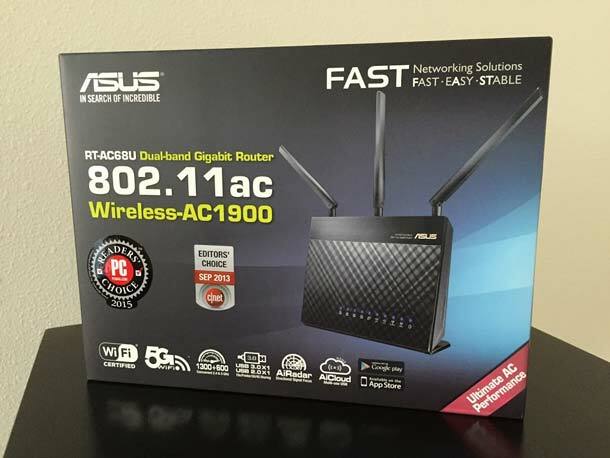 Today we’re gonna look at our favorite router, the Asus RT-AC68U, also called the Asus Wireless-AC1900. We got one for our house in January, both of ours parents got this router at our recommendation, and my sister and her techie husband also upgraded to this router this year. Suffice to say, we’ve gotten pretty familiar with this router and we’re convinced it’s the best bang for your buck right now in wireless routers. TL;DR: it’s excellent, we love it, and we recommend it to everyone who asks us for router recommendations. If your home is home to a few laptops, desktop computers, a TV streaming device like Roku or Chromecast, a couple gaming consoles, a bunch of mobile phones, and perhaps a smart thermostat or Amazon Echo (like ours is), this is the router for you. It’s the best balance of price and specs and won’t be obsolete anytime soon. The “AC-1900” refers to the router’s max bandwidth. You can get a connection at 1900 megabits per second (just a wee bit short of 2 gigabit/second) if you have the right hardware. If you have a network card that supports it, it will combine the 802.11AC(1300Mbps over 5G) + 802.11N(600Mbps over 2.4G) signals to get your computer to 1900. If you don’t know what any of this means and you know your hardware is just average, you could save a few bucks and get the 1750 version of this router instead. a 3,300 sq ft two-story standalone home built in the 1980s (my parents’ home). The router is on the 2nd story at the far end of the house. a 3,500 sq ft three-story standalone home built in the 1990s (my partner’s parents’ home). The router is on the first floor at a far corner of the house. a 1,300 sq ft one-story attached ranch built in the 1990s with basement (my sister’s home). The router is on the only floor, at one end of the house. another 1,300 sq ft one-story duplex ranch built in 2011 (our house). The router is on the only floor, located roughly centrally in the home. These setups are not textbook ideal. Because of where the cable comes in, the two biggest homes in our sample have the router placed up against a wall at a far end of the house. Both of these houses (our parents’ houses) were notorious for dead zones in like 1/3rd of the house, dropped WiFi connections, weak WiFi connections, and lots of pausing/buffering while streaming before they upgraded to the Asus. In my sister’s 1,300 sq ft home, the router is on the first floor (along an outside wall) but the computers and gaming systems are in the basement below. Even in this case, the WiFi signal is strong. However, despite all these “less than perfect” setups, all four homes have a strong WiFi signal everywhere inside the houses and even some more signal out in the yard. That’s how awesome this router is. These four houses vary in construction materials, broadband supplier, the number of WiFi networks nearby, and the demands placed on the network, but the signal strength is excellent in all four. In short, this router is awesome for big houses, even if you can’t position it somewhere “ideal”. It’s so fast and easy, I didn’t bother to document it. It’s like a 6-step wizard and the hardest part is naming your network (pick a good one – but just in case you don’t, you can easily change it later). Firmware updates come about once a month and contain security updates, bug fixes, UI improvements, and even new features like the recently-added traffic analyzer. This regular support keeps the router up to date against newly discovered security vulnerabilities, and helps the router’s feature set stay competitive with new competitor models. Also great: Asus accepts bug fixes from the developer community, meaning there’s even more people scrutinizing the router’s capabilities and security features. 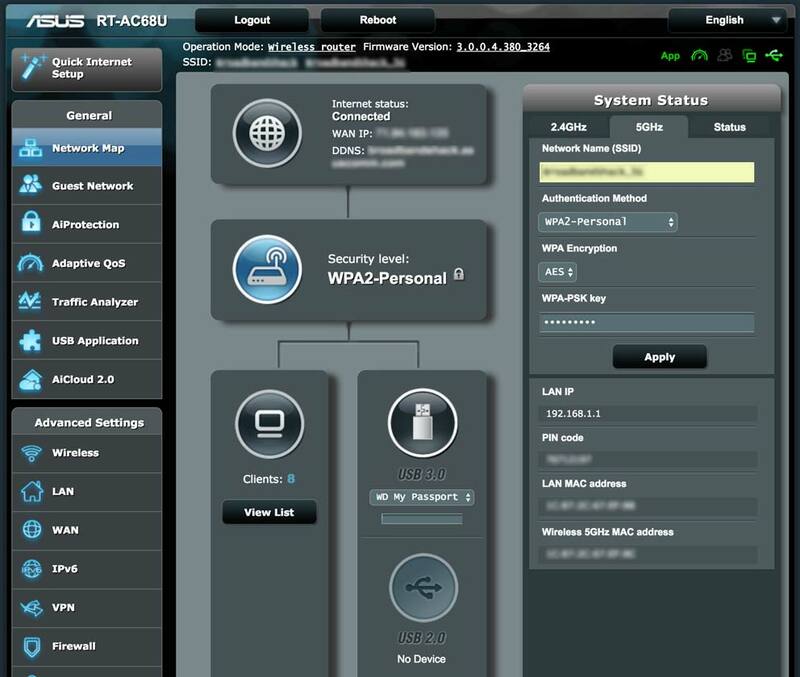 See some of the recent Asus 86 RT-AC86U firmware updates here. Once you’re all set up, visit 192.168.1.1 in your browser to access the control panel. 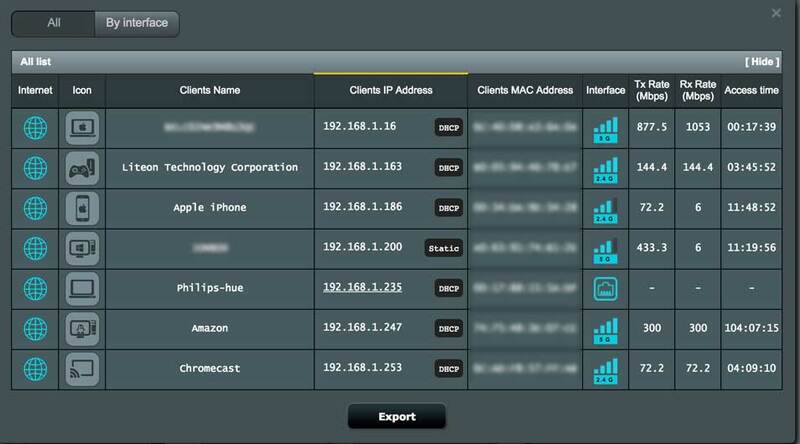 From here, you can view connected devices and their bandwidth usage, change the network’s name, password, and security type, and adjust a variety of settings. I’ve managed a lot of routers over the years and this interface is definitely my favorite. See a list of all currently connected devices. Use the “guest network” feature to give your visitors an “Internet only” version of your network. This is an excellent security feature, as it lets your guests surf the web without also getting access to any computers, files, or equipment you might have otherwise have available over the network. 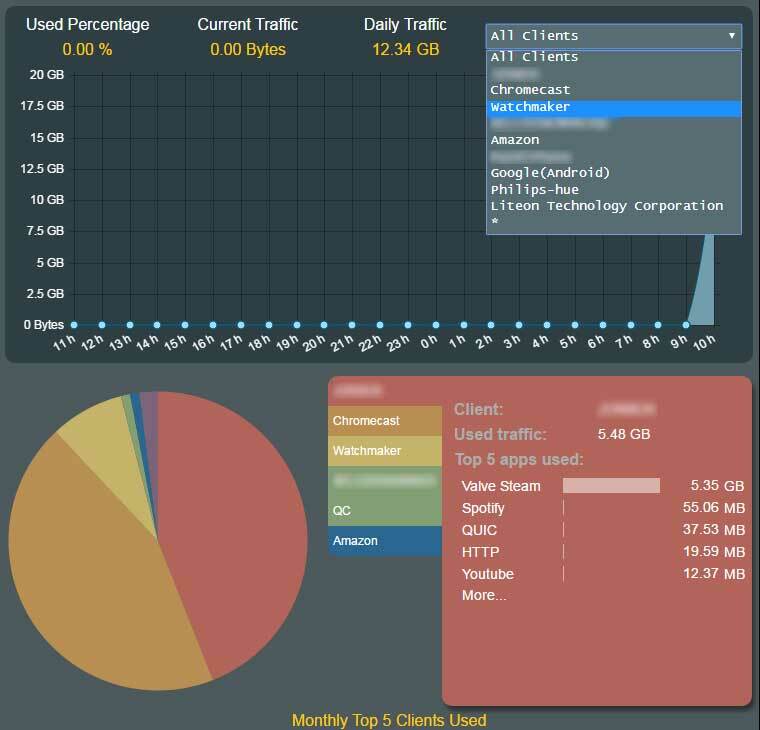 This is another cool feature of the Asus RT-AC86U: use it to see where your bandwidth goes, by app and by client (user). 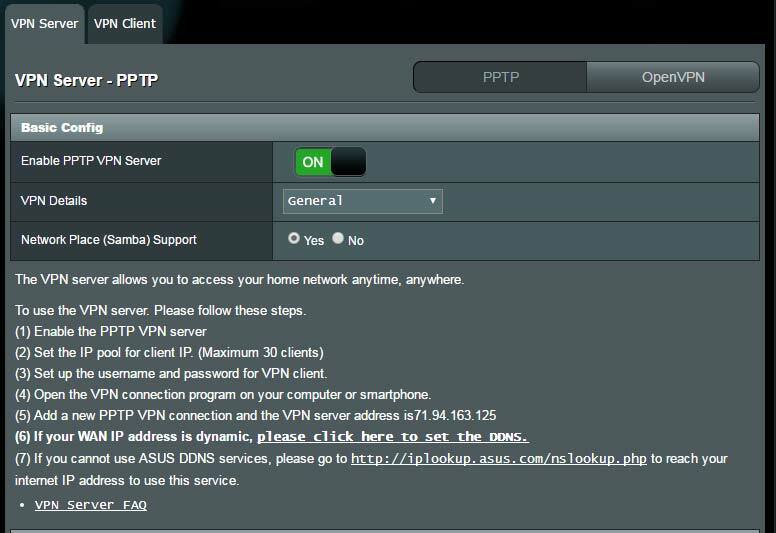 One of the biggest reasons we chose the Asus RT-86U over its competitors was for the PPTP VPN connection capabilities. With Open VPN (which is what a lot of competitor models have) you need third party software to log into your network (which may or may not be available for your OS). With PPTP VPN, the VPN software is basically in the router’s OS, and you can VPN in from anything (your Android phone, your Macbook, etc), with no need for third party software. If you’re never going to use VPN, this probably isn’t something you care about, but if you’re hoping to make use of VPN, this is a great feature to have at your disposal. 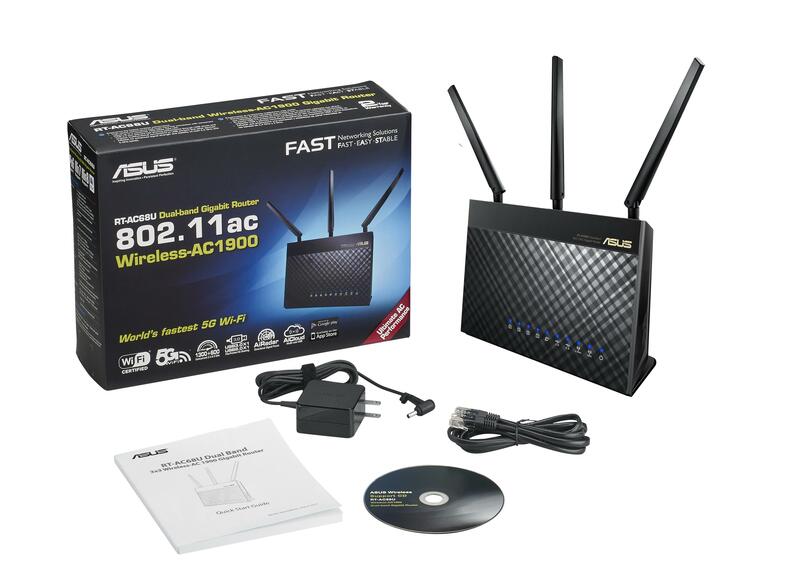 You might have noticed there’s a “1750” version of this router, also called the Asus RT-AC66U. They look pretty similar: same black plaid body, three antenna, same ports in the back. The only real difference between the 1900 and the 1750 is the maximum possible throughput. As explained earlier in this review, the only devices that hit the full 1900 throughout are those that can combine the two separate signals – 802.11AC(1300Mbps over 5G) and 802.11N(600Mbps over 2.4G) to make 190Mbps. We found only a negligible price difference between the 1900 and the 1750 when we were router shopping, so we went with the 1900 to be a bit more future-proof with our purchase. Astute readers might recall that we have a Netgear AC1750 in our city apartment. The Netgear AC1750 is still an excellent router. The only reason we chose the Asus AC1900 over another one for the house (which is 100 miles away and we only get to on weekends and holidays) was for the Asus’s stronger VPN support, which we use regularly. Why buy a router when you can lease one from your cable company? Just a few years ago, the only people who really wanted or benefitted from a better router than the one you could lease from your cable company were gamers and people pirating media by the truckload. Nowadays, everyone and their mother is streaming, gaming, and surfing the web simultaneously on one home network. If you’re in a heavy use household, and you have any of the above problems, then a better router would probably make a big difference. 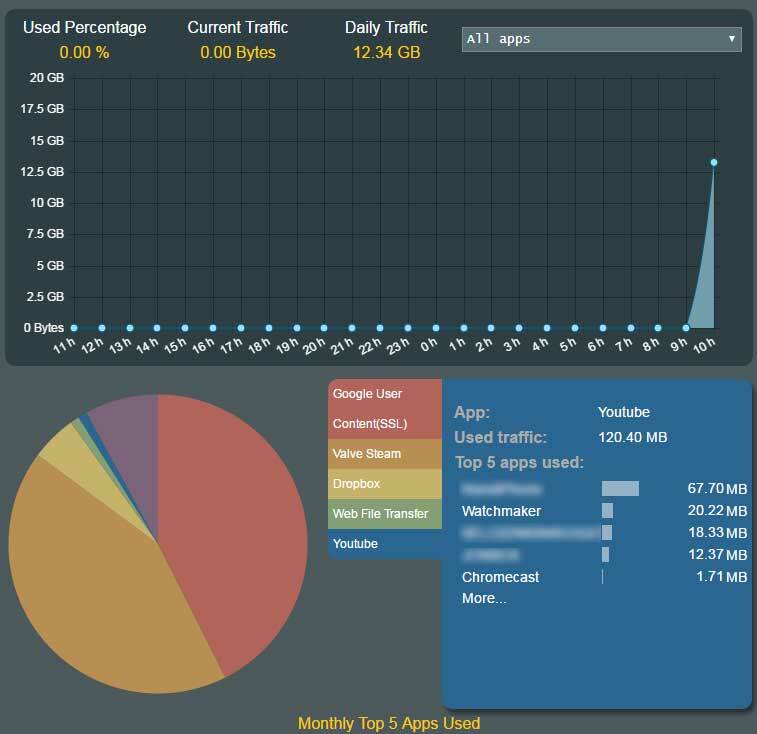 You’ll also get features like traffic analyzer, the ability to prioritize certain types of traffic higher than other types, parental controls – all features that are usually absent from ISP-provided routers. These things are true about any router, not just this one. It’s not going to turn your crappy rural DSL into a blindingly fast downloading machine, but it will make the most of what you give it and spread it far and wide. You might be familiar with the ever-changing alphabet soup of router letters. For a while, it was wireless B, then wireless G, wireless N, and now wireless AC. AC is the newest technology, and it operates on the 5Ghz band. Most routers are still wireless N, which is on the 2.4Ghz band (as are Bluetooth devices). If you live in a dense area with loads of neighboring WiFi networks (or you make use of Bluetooth music players, keyboards, mice, etc in your home) you might see a big improvement in signal quality just from getting off the crowded spectrum. Click here for a good rundown of the differences between wireless b, g, n, and ac. As with any router, you’ll need to orient the antennas. They don’t “blast” signal out their tips – it’s more like they make a flat plane of signal that’s parallel to the antenna itself. When in doubt, point one straight up and one perpendicular to it (that is, parallel to the floor). This short Lifehacker article explains ideal antenna orientation. We put this router through hell – we subjected it to online multiplayer gaming, streaming to a PSVita 100 miles away from its parent Playstation 4, streaming YouTube videos, huge downloads, and more (most of it simultaneously). We ran speed tests all over our parents’ houses, both of which are over 3,000 sq. feet, and neither of which have the router in an “ideal” location (both just stuffed it up against the wall where the cable came in), and found little to no drop in signal strength. This router is a beast, we totally <3 it – you can’t go wrong with this router! Amazon Echo Dot is BACK! October release date, new color, and more!